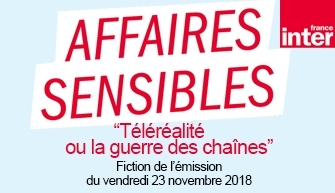 Leslie Menahem wrote this fiction to highlight the debate around the programme “Affaires Sensibles : Reality Shows or is it just a war between the stations” presented by Fabrice Drouelle on France Inter. As the voice over artist for France’s first TV reality show (I did both seasons of “Loft Story” ), I was asked by Cédric Aussir to join the group of artists collaborating on this fiction. We met on a Tuesday afternoon in the Studio 119 of the House of the Radio to record Leslie’s text. A pure joy!